Sign Tree Camp at Pine Tree Camp is a unique retreat designed for adults who are deaf or use sign or gesture and have an intellectual disability. Sign Tree Camp is scheduled for October 19-21, 2018. Many of our “campers” live in communication isolation as the only deaf person living in group homes scattered throughout Maine and beyond. Sign Tree Camp offers a fun, language-accessible camp experience in a barrier-free environment. Pine Tree Camp is set on 285 fully accessible acres of woods, fields and more than a mile of waterfront on North Pond in Rome, Maine. 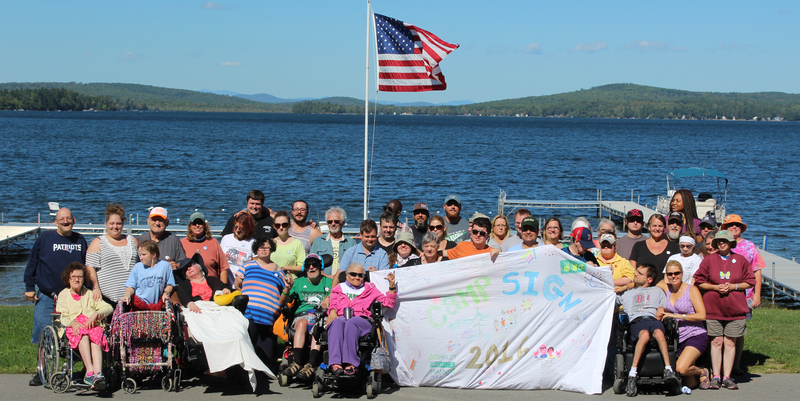 During their stay, campers will have the opportunity to connect with a peer group and benefit from participating in a full range of recreational activities all adapted to meet their needs. Campers will stay in beautiful new fully accessible camper cabins with breathtaking views of North Pond. Hearing staff who work with and support campers will benefit from workshops and training opportunities designed to build skills in Visual Gestural Communication to better support individuals long after Sign Tree Camp has ended. Sign Tree Camp at Pine Tree Camp is looking for volunteers to fill a variety of roles. If you are interested in volunteering, please contact us at ptcamp@pinetreesociety.org.